The i-Guide provides a parental controls feature, which allows you to restrict viewing and purchases of TV programs and services based on your viewing preferences. Once you set a personalized 4-digit PIN, you can place Locks by movie ratings, TV and content ratings, channels or titles. You can also hide adult titles from being displayed on-screen. Press MENU on your remote to access the Quick Menu. Use the arrows to scroll to Parental Controls and press OK. Follow the on-screen instructions to create a 4-digit PIN and press OK.
Locks can be set quickly in a variety of ways anytime while watching TV or using the guide. Select the from the Quick Menu while in the Guide or watching TV. From the General Settings select Setup then Parental Controls, you can choice locks by Movie Rating, TV Rating, TV Content, Channel, Title, or Service. Under TV Content, you can lock the level of explicit content based on your viewing preferences for Violence, Language, Sexual Situations, and Suggestive Dialogue. To block content by rating select Movie Ratings or TV Ratings. The guide will automatically lock that rating and the more restrictive ratings. For example, when you lock PG - 13, movies with R, NC - 17 and Adult ratings will also be locked. Parental control settings include On Demand programming. To block all access to On Demand, from the Main Menu select Parental Controls then Service Locks. 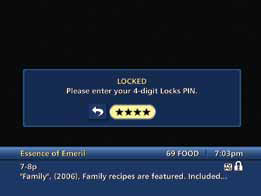 Tune to the program or channel you have locked and enter your PIN when prompted. To temporarily open or clear all locks, from the Main Menu select Setup, Locks Setup, then under Master Locks change Bypass Locks from No to Yes. Select the from the Quick Menu and enter your PIN. 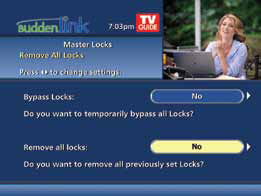 From the Main Menu select Setup, then under Master Locks change Remove all locks from Yes to No to turn locks back on. Turn the cable box off and back on.